I’m continuing to work my way through the handful of vintage metal Plague Marines I acquired last summer. I’m also combining torsos, weapons and other bits to create a few much-needed support pieces for my Nurgle followers, too, as evidenced by this lot, featuring a missile launcher, a battle standard bearer, and a vintage squad leader. The Plague Marine with the missile launcher was a bit of a kitbash … I had a spare metal missile launcher arm that I pinned to a Plague Marine torso that was helpfully standing stock upright. The addition of a pointing arm brought the whole figure together. And lastly, this standard bearer figure is very obviously not a vintage Plague Marine sculpt. But hey, beggars can’t be choosers, and the newer Nurgle icon piece fit perfectly atop this guy’s upraised pole. Give him a quick and dirty paintjob and presto — he’s a Plague Marine now! This lot brings my total number of painted Plague Marines to eight — definitely enough to field a versatile squad for One Page 40k (or Grimdark Future, I should say, since it got renamed just a few days ago). You’ve probably also noticed some nifty new terrain in the background of this post. I dipped my toe into the world of laser-cut MDF terrain and so far I’m liking what I’ve been able to do with some fairly simple kits! I’m expecting to get all of this stuff onto the battlefield later this month, so stay tuned! Everyone has them: miniatures that for whatever reason, you associate strongly with your hobby origin story. 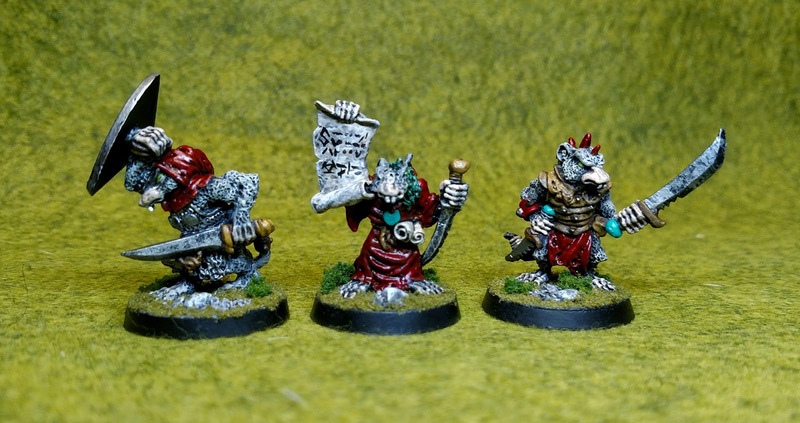 For me, these old-school Chaos Ratmen are some of those miniatures. Produced in 1986, these guys were a decade old when I arrived in wargaming in 1996. And although I never played Warhammer Fantasy, seeing these awesome figures in the pages of White Dwarf magazine really helped kindle my imagination in those early years. After an adolescence surrounded by the elves and dwarves of Tolkien lore, seeing a completely reimagined fantasy race — imbued as they were with magic, mystery and lore — was absolutely exhilarating. Fast forward 15 years, and I managed to get my hands on a bag of loose, poorly painted Skaven models at the Games Plus gaming auction. At about $1 per figure, I knew it was a good price, but it wasn’t until I pawed through the bag that I knew I’d found a real treasure trove. The bag contained five “Chaos Ratmen” sculpted by Jes Goodwin, from the “C47” release back in 1986. 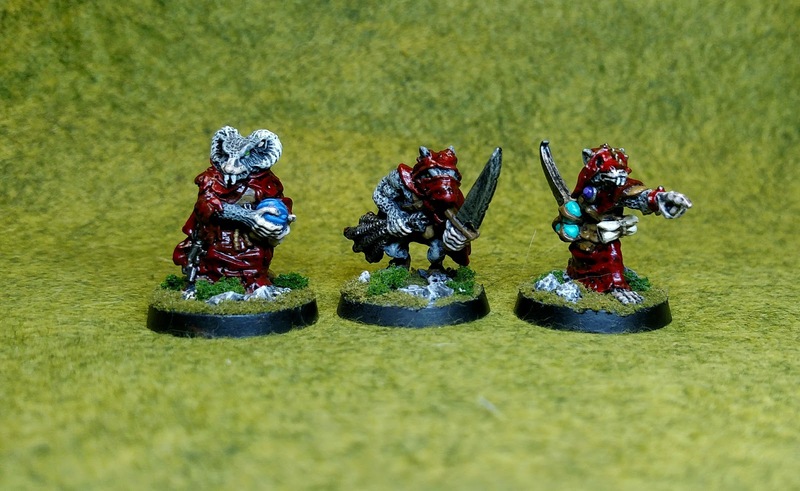 This was before the Skaven were a proper army … these guys were just another type of Chaos mutant in the Warhammer World. These figures are just completely unique in a way that only old-school Citadel minis can capture. Here’s the original sell-sheet. Anyway, the bag included plenty of mid-1990s Skaven figures too, which are plenty awesome, as well as some Marauder and Harlequin rat-guys…maybe 12 figures in all. Everything went into paint stripper and I forgot about them until spring 2015, back when I lived in Chicago. 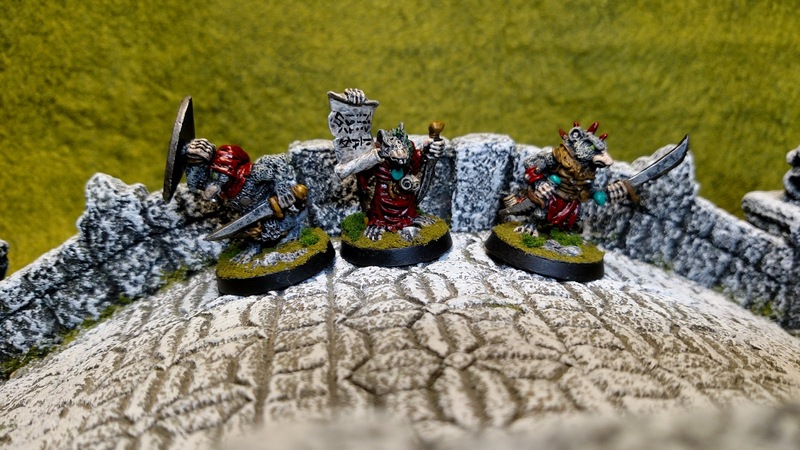 In a burst of inspiration, I dredged the Chaos Ratmen out of the depths of my lead mountain and gave them the brushwork they do dearly deserved. I’m not sure if it’s visible in these pics, but I deliberately tried to stick to a simple paint scheme in keeping with the old-school nature of these figures. Doubtless they’ll take to the battlefield soon enough, either in Song of Blades & Heroes or Open Combat!